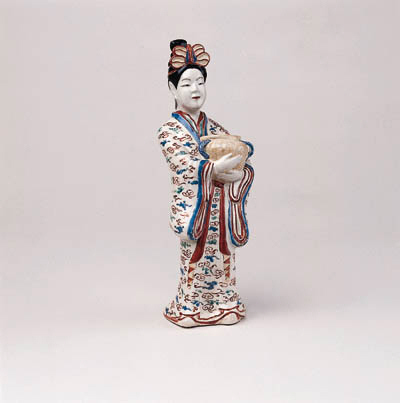 A similarly decorated figure in the collection of the Aichi Ceramic Museum is illustrated in the catalogue, Aichi ken Toji Shiryokan, no. 88. A similar example of a Bijin holding a basket is illustrated in Nihon Toji Zenshu, vol. 24, Kakiemon. Figures of similar form are illustrated in Hayashiya Seizo, Nihon no Toji, vol. 9, pls. 30, 31, 161-166, Sekai Toji Zenshu, vol. 8, pls. 49, 50, Imaizumi Motosuke, Genshoku Nihon no Meito, Ko-Imari to Kakiemon, pl. 68 and Soame Jenyns, Japanese Porcelain, pl. 63B.